The success of the Crawford Fund training program relies on the commitment of many partners in Australian institutions who give their time and energy in providing the training supported by the Fund. There are a special group of trainers who have shown an enduring dedication to our training and we plan on profiling these committed individuals as a small token of our appreciation and the esteem in which they are held. 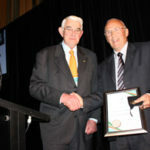 Lester Burgess was recently acknowledged for his work with a profile in our annual report and a special presentation at the Crawford Fund’s 2012 conference dinner. 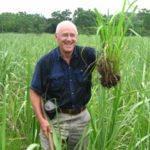 Professor Lester Burgess is an eminent plant pathologist and internationally recognised expert on the biology and control of Fusarium diseases. He is Honorary Professor in the Faculty of Agriculture and Environment at the University of Sydney and was a distinguished Dean of Agriculture before retirement from full-time academia. How lucky are we and our trainees to have someone of his professional calibre and with such personal commitment to partner with us in delivering much–needed training to help developing countries with their plant protection efforts. We are particularly proud of Lester’s work in Laos. In 2009, he started working with a group of struggling young, female plant pathologists comprising the Plant Protection Centre in Vientiane. With Crawford funding support, and that of his wife Jillian, Lester has spent lengthy periods in Laos each year improving the professional skills and English of this group by working with them to diagnose and identify the management options of real-world plant diseases. As well, building on earlier Crawford Master Class relationships, Professor Burgess (again with Jillian) has been working in Tunisia with a group of remarkable scientists involved with soil borne diseases of wheat. Earlier this year, he spent three months there with them, in labs and in the field establishing trials and convening a North African Fusarium workshop. He has plans to return regularly. At the moment, Lester has some Tunisian guests in Australia – Dr Mohamad Salah Gharbi and Mr Salah Lamouchi who are here to study our farming systems, crop rotations, direct drilling and planters, and herbicide use, as well as to network and establish contacts amongst researchers, consultants and farmers in northern NSW and SA. Gharbi is the Leader of the National Durum Breeding Program with a number of new varieties to his credit with enhanced resistance to Septoria leaf blotch, the number one leaf disease in Tunisia, as well as other improvements. He is also one of Tunisia’s leaders in agricultural science generally who grew up on the family farm and interacts extensively with farmers providing advice on all aspects of cereal production, and mentors many younger researchers especially the small team working with Lester to establish a research and extension program on soil-borne fungal diseases of cereals including Fusarium foot rot, take-all and eyespot. Salah is one of Tunisia’s leading wheat farmers and is a key member of an informal consultative group of farmers Lester has established to help define the objectives of field studies. He also hosted the group’s first field trial last season and will again be a host of trials next season on crop rotation and the incidence of soil-borne diseases. Professor Burgess has been involved with the Crawford Fund for just on 20 years. He convened the first Crawford Master Class on the biology and management of crop diseases caused by soil-borne fungal pathogens and has since convened or participated in Crawford Master Classes in Indonesia, Turkey, China, Tunisia as well as Australia. He has also delivered hands-on training for Crawford in other ways. These include formal courses of instruction as well as less structured (but still intensive) mentoring and capacity building of groups of promising scientists in many other countries including China, Indonesia, South Africa, Turkey and Vietnam. In 2003 he received a medal for his contribution to rural development in Vietnam. All this on top of a distinguished career educating and training young scientists in agriculture at Sydney University, mainly Australian but with many post grads from developing countries. Not to mention an extensive engagement in Indonesia and Vietnam with ACIAR projects. The Crawford Fund is pleased to honour the contributions of Professor Lester Burgess to International Agricultural Research.